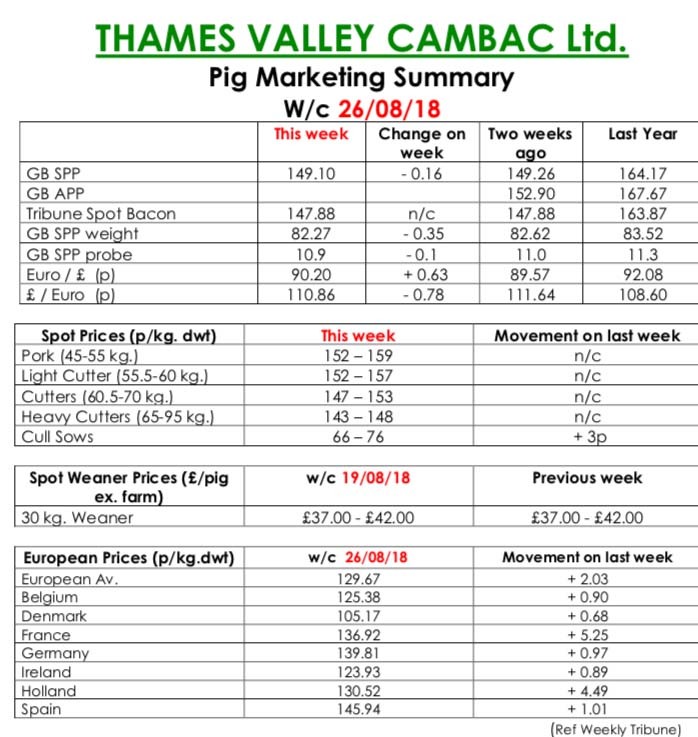 This week’s Slaughter Pig Marketing Summary from Thames Valley Cambac said that the late summer Bank Holiday caused little disruption, with all the majors killing a full five days. Whilst there are many comments of poor demand and pressure from retailers, processing on a Bank holiday must indicate a somewhat decent undercurrent of demand. The SPP was slightly lower, and all contract contributions stood on. The fresh meat market was steadier however, as the holiday disrupted trade. Prices stood on however, with some outlets hoping that fortunes would soon turn as we approach September. 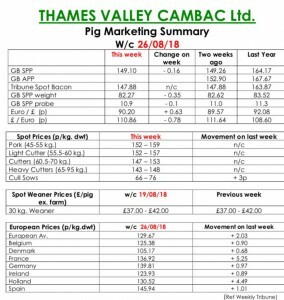 There was further encouragement in the cull sow market with another 3p increase on the back of strong demand from Germany. In Europe, prices continued to improve with both France and Holland seeing increases of 4 eurocents. Price quotes in sterling were further enhanced by a stronger Euro that ended the week up 0.63p at 90.20p. The Weaner Marketing Summary for week commencing August 19, reported that demand remained very poor with many fatteners echoing industry concerns about increased feed costs. Some exploratory quotes were worryingly below cost of production. The prices announced by the AHDB saw the weighted average for a 30kgs pig fall by 87p to £51.92 and the weighted average for a 7kg rise by £1.10 to £38.51.